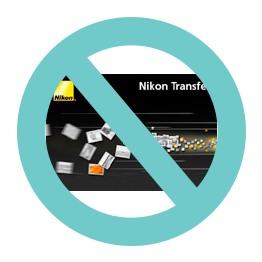 If you have a Nikon D800 – possibly any recent Nikon DSLR – avoid using OLD VERSIONS OF Nikon Transfer to copy files from your flash cards. I honestly don’t understand why a Lightroom user would ever use Nikon Transfer, but some do so. And what they’ve discovered is that it makes the D800 raw files unreadable – and not just in Adobe software. See this thread about D800 corruption and this too. What’s more, it’s not a new problem and relates to standalone versions of Nikon Transfer – ie before it became part of View NX. Without digging into more detail than I think it’s worth, it’s hard to tell what’s happening. For all I know, maybe Exiftools or some other utility can resolve the problem by deleting any metadata added by Nikon Transfer. I don’t know if that’s possible though. While I am surprised LR/ACR are tripped up by whatever Nikon Transfer did to the files, the solution is very simple – don’t use crappy old Nikon software.